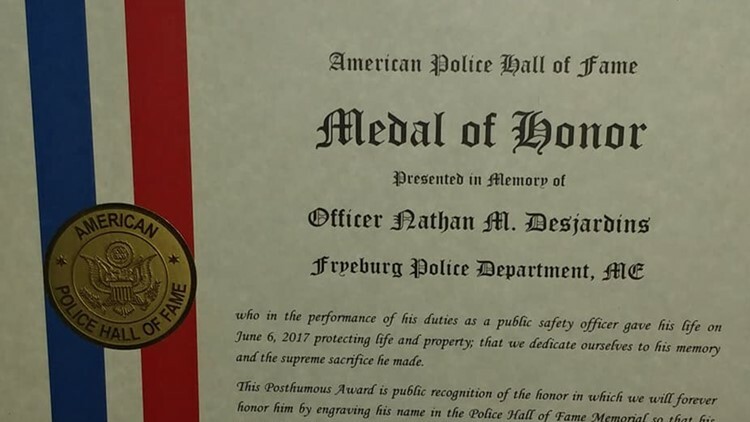 The Fryeburg Police Department has a new display to honor fallen Officer Nathan Desjardins, who was critically injured and died during his first day of training in 2017. FRYEBURG, Maine — The Fryeburg Police Department thanked Officer Joseph Bubar and Sergeant Heidi Johnston Wednesday for a display they donated in honor of fallen Officer Nathan Desjardins. The department's public Facebook post invited the community to come see the memorial display to celebrate the young man who tragically passed away nearly two years ago. Desjardins was just 20 years old when he was hurt in a violent boat crash on Saco River during his first day of training in June 2017. Officer Dale Strout, who has since recovered, was driving their patrol boat when it hit something in the water and threw both men over the sides. The two officers were originally sent out to look for a woman who fell from a boat into the river days before. Two men in a canoe rescued the officers by calling for help on Stout’s radio and waiting with the men until a rescue boat arrived. Stout and Desjardins were airlifted to Central Maine Medical Center in Lewiston where Stout overcame his injuries, but Desjardins passed away on June 6. Desjardins was studying nursing at the University of New England at the time of his death. He was also working as an EMT.